The Plastic Injection Molding Market has been continually evolving and expanding in recent years. 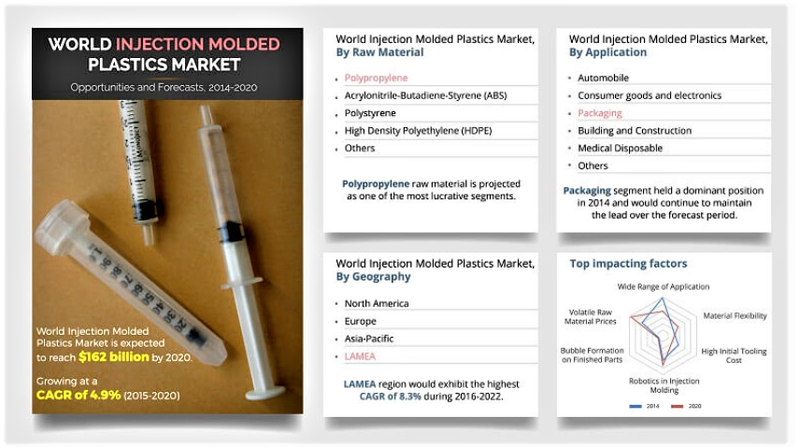 And according to Global Market Insights, plastic injection molding has become one of the most commonly-used plastic formation techniques utilized across a variety of industrial applications today. Industrial sectors in automotive, consumer goods, electronics, general construction, packaging, medical and more, are all benefiting from the emerging trends in plastic injection molding manufacturing and showing steady growth. In fact, the global injection molded plastics market is expected to reach a whopping $162 billion by 2020. There are several growth drivers spiking a rise in the demand for injection-molded plastic items. Following, we look at some of the trends taking place that are catalysts for this steady progress in the plastic injection molding industry. One trend being seen is manufacturers’ use of durable, temperature- and corrosion-resistant materials. Makers in industries like automotive are using these types of materials – instead of steel – to increase the longevity of components and realize other benefits like lowering the weight of various parts to improve overall fuel efficiency. Furthermore, the use of bio-resins (eco-conscious plastics) continues to gain traction in the plastic injection molding arena since they have a lower impact on the environment than oil or petroleum-based resin – without sacrificing their usability. Finally, technology has now evolved that allows plastic makers to mold metals, ceramics and carbides – in addition to plastics. Technology upgrades are coming in 2019 to commonly-used software in plastic injection molding manufacturing. Designing software like SolidWorks and MoldFlow from Autodesk are including updates and enhancements that will assist in improving plastic part and injection mold designs, as well as the overall manufacturing process. Improving the design quality and accuracy from the start ensures lower costs and future savings in rework projects. Other developments in these kinds of software programs include the ability to simulate how melted plastic flows during the injection molding process, to better predict manufacturing-related defects. This allows designers to evaluate and modify part manufacturability and make necessary adjustments, early in the design process, resulting in cost-savings along the way. For over 25 years, the US and other developed countries have been sending huge amounts of plastic waste to China vs. recycling it here in the United States. And since the UN Comtrade Database has been monitoring recycling efforts since 1992, about half of the world’s plastics set for recycling have been exported to China. However, approximately a year ago, China’s National Sword policy – banning plastic waste from being imported – went into effect. As a result, plastic mold makers and other manufacturers are being forced to generate a responsible recycling plan for handling and disposing of plastic scrap, in an environmentally-friendly way. The use of plastic composites is a growing trend for plastic mold makers, as these composite materials typically exhibit low weight and high strength. Common fibers being injected into plastics include: glass, carbon-based fiber, and aramid. Industries benefiting from these reinforced plastics products include: automotive, aerospace, construction, power, marine, Nano materials and more. The use of reinforced plastics in manufacturing is an appealing trend, as per-product costs are reduced in various applications, while maintaining part strength. In applications such as automotive and aerospace, a reduction in part weight can increase the value of the final product through better fuel economy and enhanced aerodynamics. As these trends in plastic injection molding continue to take shape in 2019 and beyond, you’ll benefit from a partnership with an industry expert in plastics manufacturing. United Global Sourcing works with factories that are on the cutting-edge of these trends and others affecting the industry. So, to take stress out of the manufacturing process and ensure a smooth process from design to finished product, be sure to partner with our experienced staff members. We have relationships with factories across the globe, ensuring the ability to link your manufacturing requirements to the factory best suited for your specific and customized needs. For a quote or more information, contact us today. We look forward to helping turn your ideas into high-quality manufactured products!